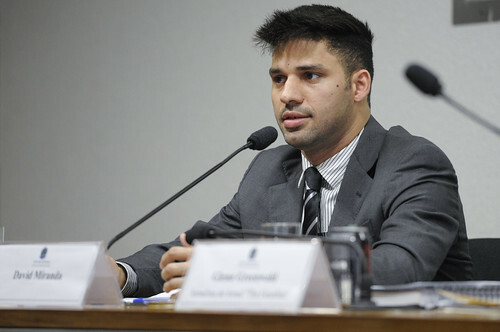 A British high court has decided that the detention of David Miranda, partner of journalist Glenn Greenwald, under a provision of the United Kingdom’s terrorism law was “lawful.” The objective of his detention was “not only legitimate but very pressing.” He had in his possession material that was “stolen” from the National Security Agency by whistleblower Edward Snowden which if made public would have posed a risk to life. “I’m convinced they’ve hurt their own country far more than me with this ruling, as it emphasizes what the world already knows: the UK has contempt for basic press freedoms,” he also told The Intercept (of which Greenwald is a writer/editor). Miranda was detained at Heathrow Airport on August 18 when he was on his way to Rio de Janeiro from Berlin. He was held under a terrorism law provision known as Schedule 7 for the maximum period one can be held without charge and authorities seized electronics equipment he was carrying including a mobile phone, laptop, camera, memory sticks, DVDs and gaming consoles. He had been staying with journalist Laura Poitras. Security Services and the Metropolitan Police Service in the UK hoped they would be able to obtain access to any documents from Snowden that he may have been carrying. Lawyers for Miranda argued that the detention had been improper and disproportionate. It violated press freedom, posed a threat to sources and there was no threat to national security posed by the fact that Miranda may have had material from Snowden. “Responsible journalism” would have been practiced and people in intelligence agencies who needed to be protected would be protected, as they had been by reporters covering previous national security stories involving documents with names. Lord Justice Laws did not find that any of these arguments trumped the national security interest of UK security services, which the Lord Justice believed the services were well within their authority to intercept so the “stolen” material did not become public for consumption and use by terrorists. “The disclosure, or threat of disclosure, is designed to influence a government, and is made for the purpose of promoting a political or ideological cause. This therefore falls within the definition of terrorism and as such we request that the subject is examined under Schedule 7.,” according to the final PCS. The definition of “terrorism” is “very broad” in the law. Lord Justice argued this was what Parliament had intended. Parliament had also intended for officers conducting the stop to not know why they were stopping a person an intelligence agency wanted stopped “to prevent any unwitting disclosures to the subject of the examination.” So, since officers had “good faith” to believe Miranda posed some kind of threat—because the Security Service told them he did, they were within their broad authority to detain, search and seize property from him. “We are equally disappointed with the statements of the court regarding the role of journalists in a liberal democracy. In particular, the judgment questions the media’s authority to decide on publishing material relating to national security, stating that this is a constitutional role reserved for governments. We believe that this would limit journalists’ ability to cover stories of the greatest national importance and public interest,” the joint statement added. The cold hard fact is the three judges wholly vindicated the police. It accepts that it was appropriate to steal the material because, alarmingly, according to the court, the “58,000 highly classified UK intelligence documents” Miranda had were not “journalistic material.” It reaffirmed the position of UK Home Secretary Theresa May: “If the police believe any individual is in possession of highly-sensitive stolen information that would aid terrorism, then they should act. We are pleased that the court agrees.” And, it accepted that the security services may continue to go through material and possibly bring charges against “some individuals” for offenses committed. Not until the final Port Circulation Sheet did the Security Service make any suggestion about Miranda having material that would aid terrorists but, when police were reticent to conduct the detention, they crafted a justification so they could use their power to seize property from him. It did not matter to the judges that influence or coercion by terrorists typically involves violence or threats of violence and influence or coercion by journalists or whistleblowers involves concealed truths or the threat of revealing concealed truths, an entirely non-violent act. Nor did the judges care that this trivializes terrorism by treating acts that reasonable people would agree are not terrorist acts as acts of terrorism. With this ruling, the Security Service can claim to the police that a journalist or person supporting an act of journalism may appear to be carrying material that could be helpful to “terrorists” and that is enough to justify detention for the maximum period under the law. There does not need to be evidence of “intent” or “recklessness,” each “foundational concepts of criminal law.” Mere possession makes one vulnerable to being targeted by the security state. All journalists engaged in journalism on stories that involve government documents related to issues of national security should steer clear of the United Kingdom. The ruling political class, courts and some in the press find it perfectly acceptable to think acts of investigative journalism could lead to terrorist acts of violence without security state intervention.